Four senior members of the Penn Manor field hockey team have formally accepted offers to attend college on field hockey scholarships. Emma Evarts has committed to St. Francis University, Cassie Kline will attend Penn State University, Brionna Kline has committed to Bloomsburg University, and Carolyn Sloss will attend Kent State University. The student athletes signed letters of intent Wednesday, one day after their team defeated Central Bucks South to earn a shot at the state AAA field hockey title. The Comets will play the championship game against Palmyra at 2 p.m. Saturday at Zephyr Sports Complex, Whitehall High School, near Allentown. 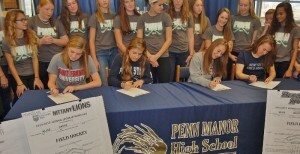 Congratulations on your future endeavors, girls, and good luck on Saturday! From left, Emma Evarts, Cassie Kline, Brionna Kline and Carolyn Sloss sign letters of intent to play field hockey in college.